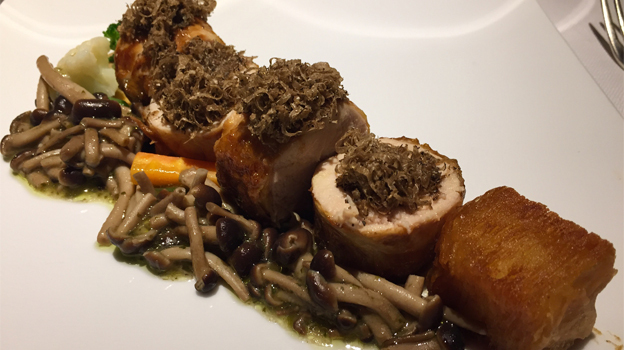 If it’s not Venice’s best restaurant today, Il Ridotto certainly has the city’s most interesting and inventive food. The small dining room offers a gourmet dining experience enhanced by fine ingredients and a fairly priced, well thought out wine list. Located not far from piazza San Marco, Il Ridotto, which translates in Italian to “reduced” is in fact a small restaurant with only two rooms and just a few seats for patrons. Reservations are essential. The decor is strikingly modern and minimalist. Given the small size of the place, tables are tucked close to each other and wines kept on a main ledge far away, which is far from an ideal situation, since wine glasses invariably linger empty before waiters pass by to fill them. 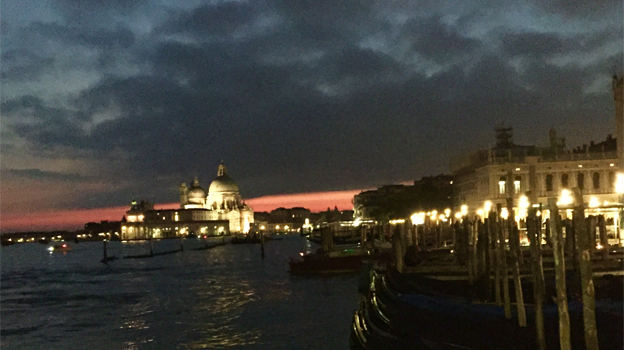 However, the food is the main attraction, as it’s the most inventive in Venice. The fairly priced wine list (by Venice standards) is rich in many interesting and varied choices. 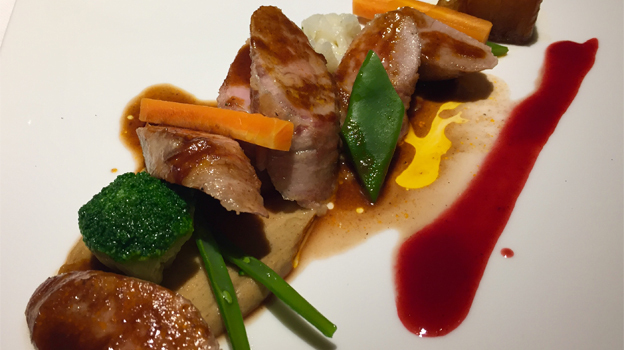 Although the food is plated in a nouvelle cuisine style, portions are copious while the flavors are intense and savory. You won’t walk away hungry. The black spaghetti with sea urchins, candied bell pepper and friggitelli was an outstanding start to the meal. 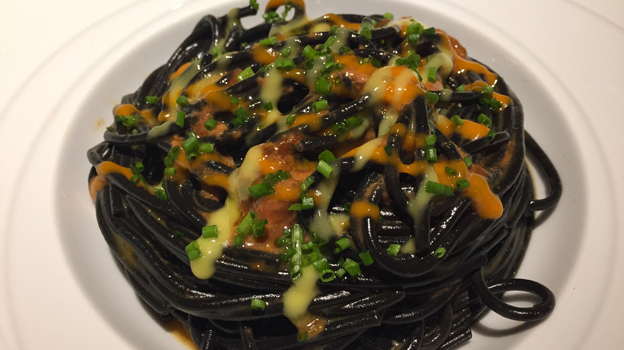 Briny sea urchins added zip to the perfectly cooked black squid ink spaghetti that benefitted from an added crunchy twist thanks to the friggitelli. 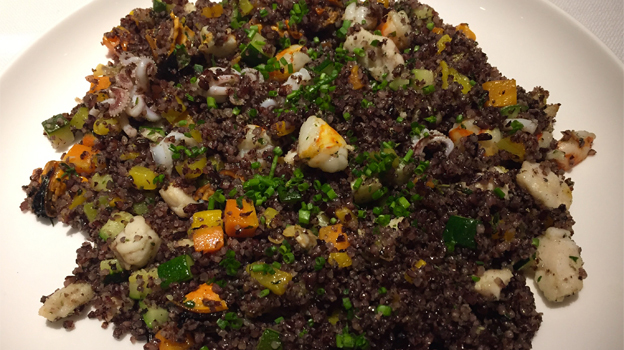 The black rice couscous with sautéed vegetables and fish catch of the day was similarly successful, with each ingredient standing out on its own but also part of a harmonious whole. The suckling pig filet with bean purée and raspberry sauce and guinea fowl were perfect foils for the Grange, although both dishes packed noteworthy savoriness, and may not be to everyone’s palate. 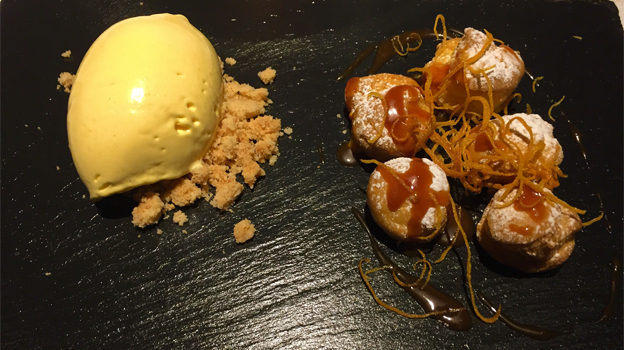 I especially enjoyed my dessert, which showcased a lovely balance between sweet and acid elements. It tells you something about the cuisine at Il Ridotto that the food wasn’t at all overshadowed by the star studded lineup of wines I chose to drink. The 2005 Fontaine-Gagnard Criot-Bâtard Montrachet was rich and creamy; and though I have had more refined vintages of this wine, it was well balanced and flavorful, while showing no signs of premox. It certainly stood up well to the wholesome, rich spaghetti and couscous dishes. 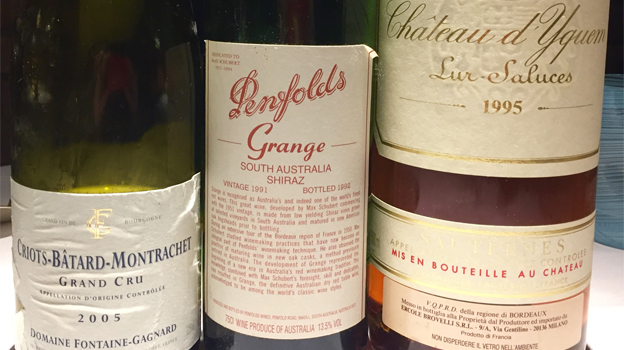 The 1991 Penfolds South Australia Shiraz Grange is an iconic wine that I always enjoy tasting, but on this night I found its extremely ripe, almost jammy flavors a bit too much and overpowering for the delicately nuanced, savory meat dishes I chose. The wine was undoubtedly striking in its depth and richness, and I can see why many have extolled this vintage’s virtues over the years. That said, I suspect those of us who prefer slightly more nuanced, vibrant wines will be less impressed. Personally, I had trouble drinking more than a glass and a half. I closed things off with another beauty, the 1995 Chateau d’Yquem. Less rich and jammy than some other vintages of this starred property, its interplay of tropical fruit and saffron, buoyed by hints of lemony botrytis and well balanced acidity proved the ideal tonic by which to call it a happy night and brave beautiful Venice’s bone chillingly cold winter wind.